It was quite true. Cinderella, even dressed in rags with a dusty grey face from the cinders, was a lovely girl. While her stepsisters, no matter how splendid and elegant their clothes, were still clumsy, lumpy and ugly, and they always would be. One day, beautiful new dresses arrived at the house. A ball was to be held at Court and the stepsisters were getting ready to go to it. Cinderella, didn’t even dare ask, “What about me?” for she knew very well what the answer to what would be. “Oh dear, I’m so unhappy!” and the cat murmured “Meow”. “How can I, dressed in rags?” Cinderella replied. “The servants will turn me away!” The fairy smiled. With a flick of her magic wand, Cinderella found herself wearing the most beautiful dress, the loveliest ever seen in the realm. “Good!” exclaimed the fairy. With a flick of her magic wand — wonder of wonders! The pumpkin turned into a sparkling coach and the mice became six white horses, while the seventh mouse turned into a coachman, in a smart uniform and carrying a whip. Cinderella could hardly believe her eyes. When Cinderella entered the ballroom at the palace, a hush fell. Everyone stopped in mid-sentence to admire her elegance, her beauty and grace. “Who can that be?” people asked each other. The two stepsisters also wondered who the newcomer was, for never in a month of Sundays, would they ever have guessed that the beautiful girl was really poor Cinderella who talked to the cat! When the prince set eyes on Cinderella, he was struck by her beauty. Walking over to her, he bowed deeply and asked her to dance. And to the great disappointment of all the young ladies, he danced with Cinderella all evening. “Who are you, fair maiden?” the Prince kept asking her. “Oh, but I shall, I’m quite certain!” he replied. Cinderella had a wonderful time at the ball, but, all of a sudden, she heard the sound of a clock: the first stroke of midnight! She remembered what the fairy had said, and without a word of goobye she slipped from the Prince’s arms and ran down the steps. As she ran she lost one of her slippers, but not for a moment did she dream of stopping to pick it up! If the last stroke of midnight were to sound… oh, what a disaster that would be! Out she fled and vanished into the night. The Prince, who was now madly in love with her, picked up her slipper and said to his ministers, “Go and search everywhere for the girl whose foot this slipper fits. I will never be content until I find her!” So the ministers tried the slipper on the foot of all the girls… and on Cinderella’s foot as well… Surprise! The slipper fit her perfectly. Suddenly she broke off, for the fairy had appeared. “Come with us, fair maiden! The Prince awaits to present you with his engagement ring!” So Cinderella joyfully went with them, and lived happily ever after with her Prince. And as for the cat, he just said “Meow”! 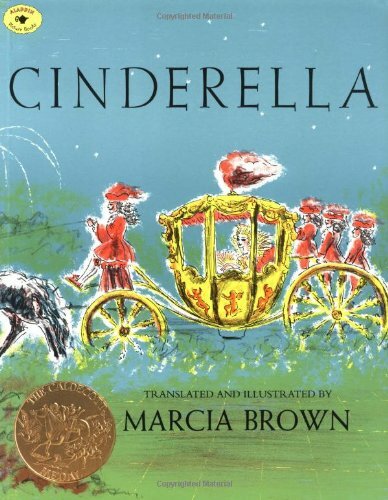 There is perhaps no better loved, no more universal story than “Cinderella.” Almost every country in the world has a version of it, but the favorite of story-tellers is the French version by Charles Perrault. This translation is excellent for story-telling and also for reading aloud. Marcia Brown’s illustrations are full of magic and enchantment from the little cupids putting back the hands of the clock to the last scene at the palace. They are pictures that will stay in a child’s mind. This brilliant edition of a timeless story is sure to become the favorite of a generation. 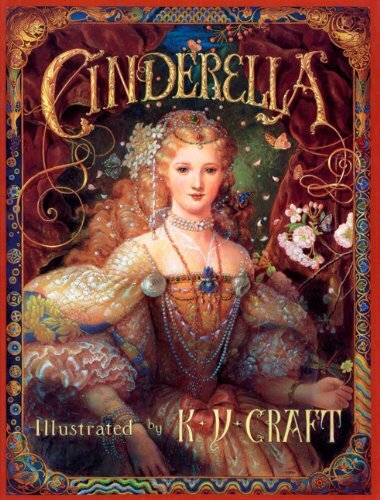 Readers young and old will be enchanted by the vision and mastery of Kinuko Y. Craft’s luminous paintings, inspired by the lavish artwork of late seventeenth-century France and embellished with extraordinary borders and ornamentation. Rich with radiant color and astonishing detail, here is a dream come true for anyone who has ever believed in living happily ever after. 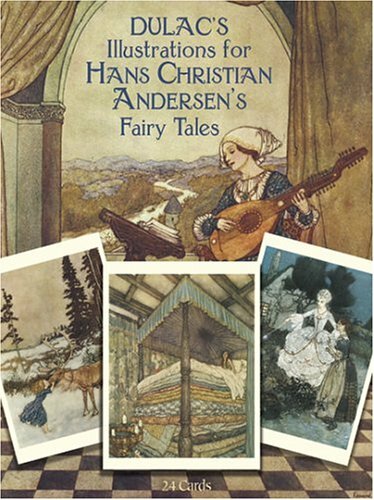 One of the greatest book illustrators of his time, Edmund Dulac (1882–1953) was also one of the most prolific and impressive artists of the early twentieth century. Covering a wide range of themes and styles, his work is characterized by the strong personalities of his figures and the elaborate backgrounds and shading of his scenes. He remains, today, among the most popular of recent illustrators. Ideal for sending brief notes to art lovers, these enthralling cards will delight fiary tale enthusiasts as well. Identifying captions appear on reverse sides. Celebrate Disney’s CINDERELLA, a modern classic that shines with beauty, imagination… and magic! Despite being bulled by her stepmother (Cate Blanchett) and stepsisters, a spirited Ella (Lily James) resolves to take charge of her fate. Add a royal ball, a Fairy Godmother (Helenal Bonham-Carter) and a glass slipper, and suddenly — magic becomes reality! The most celebrated of all the Disney classics, CINDERELLA, is also known as one of Walt Disney’s all-time favorite films. CINDERELLA has enchanted generations with its spellbinding story, charming music, and endearing characters that live in your heart forever. 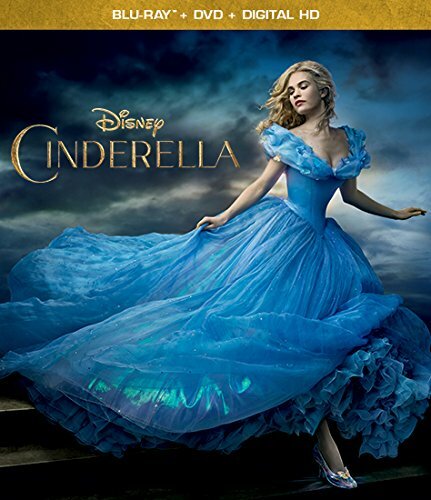 The beloved fairy tale becomes pure Disney magic as beautiful Cinderella shares her dreams of romance and a better life with the lovable mice Gus and Jaq. 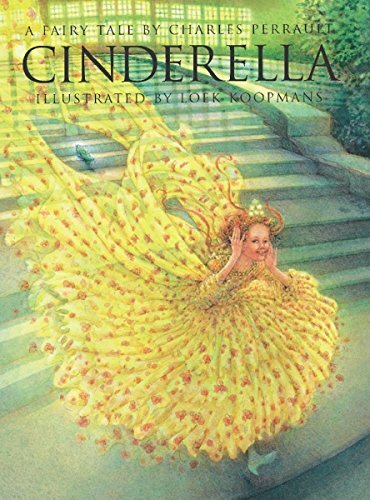 When Cinderella’s cruel stepmother prevents her from attending the Royal Ball, the delightful Fairy Godmother appears! With a wave of her wondrous wand and a bouncy “Bibbidi-Bobbidi-Boo,” the Fairy Godmother transforms a simple pumpkin into a magical coach — and Cinderella’s rags into a gorgeous gown. At the ball, Cinderella falls in love with Prince Charming, but must flee before the stroke of midnight breaks the spell! 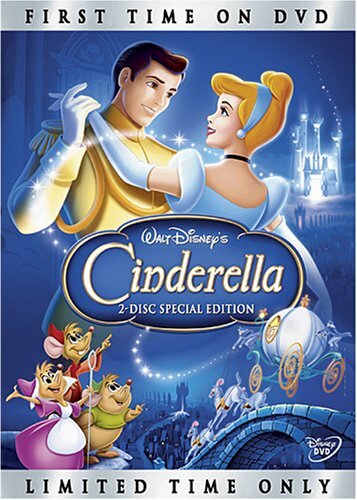 Now with an all-new digital restoration, Disney’s Enhanced Home Theater Mix, and all-new games and music videos, this 2-Disc Special Edition of Cinderella is the perfect fit for everyone who believes dreams really do come true. Also available on Video. 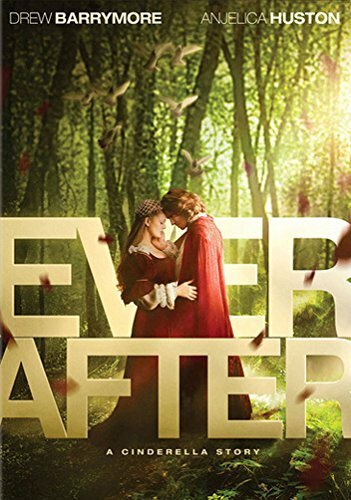 This enchanting contemporary retelling of the classic fairy tale stars Barrymore as a savvy, modern young woman of the 16th Century whose strength and courage work magic on the lives of all those around her including the crown prince of France. From the director of CHICAGO and the producer of WICKED comes a modern twist on the beloved fairy tales you thought you knew. 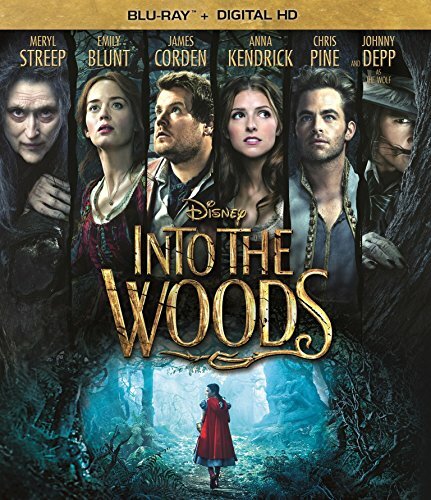 Meryl Streep stars in this epic musical saga about daring to venture INTO THE WOODS. Iconic characters, such as Cinderella, Little Red Riding Hood, Jack and the Beanstalk and Rapunzel, find their fates intertwined with a humble baker and his wife, whose longing to have a child sends them on a quest to reverse a witch’s (Streep) curse. With an all-star cast, this spellbinding adventure is everything you could ever wish for.